The house is located in a village typically from Champagne and 5 minutes from the train station, all shops and facilities (doctor’s surgery) in the middle of vineyards. It is ideal to feel at home in family or with friends. This former tastefully fitted and spacious 200 m² stable with all modern conveniences has 2 living rooms including one with a large fireplace, an office with sofa-bed on the landing, a large open plan kitchen, 3 large bedrooms and a bathroom with bath. Its asset: its garden of around 700 m² with its pool heated from mid-April (or earlier if the weather allows it) to October, equipped with Jetstream and balneotherapy and secured by an automatic rolling shutter on a fenced land which is not overlooked. You are also 30 minutes from the aquatic centre (Center Parc) where you can spend a day or a night. Most of the golf courses of Champagne are located nearby (the golf of Reims is 15 minutes and the golfs of Ailette and Menneville are 30 minutes). By high-speed train, you can reach Euro Disney and Charles de Gaulle Airport in 30 minutes and Paris Gare de l’Est in 45 minutes. We are a family with 2 children. It is a former fully renovated stable and barn. We live in this house since 1994. We tried to make it warm for the daily pleasure of our family and our guests. We rent this house in order to finance some of the travel projects we plan between the four of us. When the house is rented, we go on holidays! As this house is our, it is fully fitted. Its comfort is present in all the rooms without forgetting the fitted landscaped garden with pool which is a major asset. The kitchen is equipped with a Thermomix, one of the most sophisticated food processors on the market. The house linen (tea towels, tablecloths, napkins, etc.) is at your disposal. We also provide you with a binder listing all the activities and visits of the region without forgetting the road maps. Everything was made to offer a stay as pleasant as possible according to your wishes. In our fenced garden, the pool is private to ensure privacy and heated for more comfort during almost 6 months a year. It is equipped with Jetstream and Spa. A wonderfully rural and idyllic property in a quiet and peaceful setting. Very well equipped and spacious and well placed for visiting the champagne region. 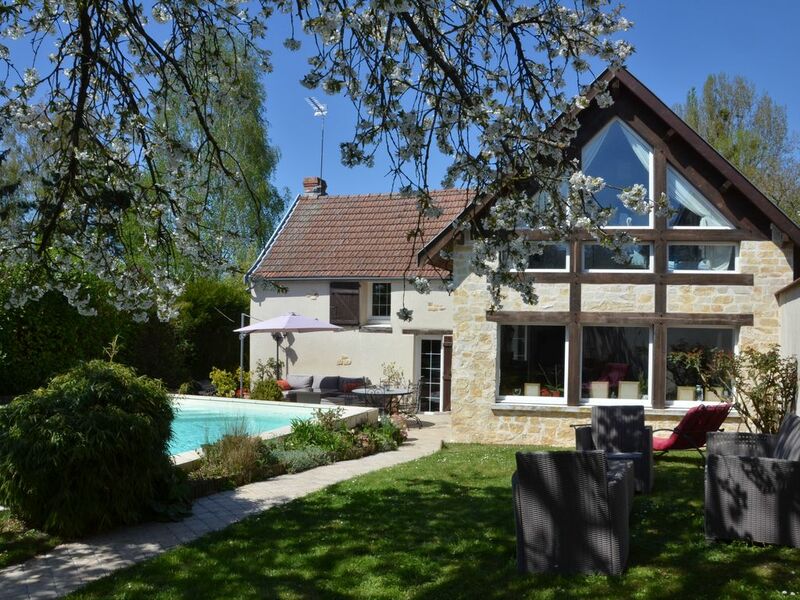 Indeed this cottage style vacation home in the very heart of Champagne province in northern France is so nice that we didn't even want to leave. The functionality of all facilities was good, three full-size bedrooms, two sitting areas and a nice dining area fulfill all requirements for a convenient family holiday (we were a group of 6 persons including two young children and two elderly people). Parking is shaded under an apple tree within the yard, the swimming pool is clean, warm and nice. Nearest shopping center with a gas station, pharmacy and a supermarket is within8 minutes drive where you can also find a traditional bakery providing the best baguettes you may find out of Paris. The landlord family is sincere and friendly, did everything correctly and well prepared for our arrival. It was a very nice time there and many thanks to the Landlord. nous avons passé un très bon weekend du 14 juillet dans un joli cadre de verdure.les propriétaires ont été très accueillants et à notre écoute. Belle maison décorée avec goût. Extérieurs très agréables. Propriétaire très sympathique. Nous recommandons cette location. La maison nous a permis de passer un excellent week-end entre amis. Nous avons passé un excellent we prolongé en famille, la maison est conforme à la description et très confortable, elle est grande et la piscine chauffée est un vrai bonheur ! Come enjoy the Flâneries Musicales of Reims that last all summer long or the Fêtes Johanniques de Reims in June without forgetting the historical Monte-Carlo Rally in January and the Christmas market (largest of France after Alsace) and many other events about champagne that take place all year round! Many marked hiking paths are available from the village and allow to have beautiful strolls and visit the surrounding villages. In Center Parc, beautiful water park 30 minutes away, you can spend a day or a night for very interesting rates. Golf: there are 3 nearby golf courses (15 minutes from the golf course of Reims and 30 minutes from the golf courses of Ailette, Champagne and Menneville). Caddy and equipment at your disposal.